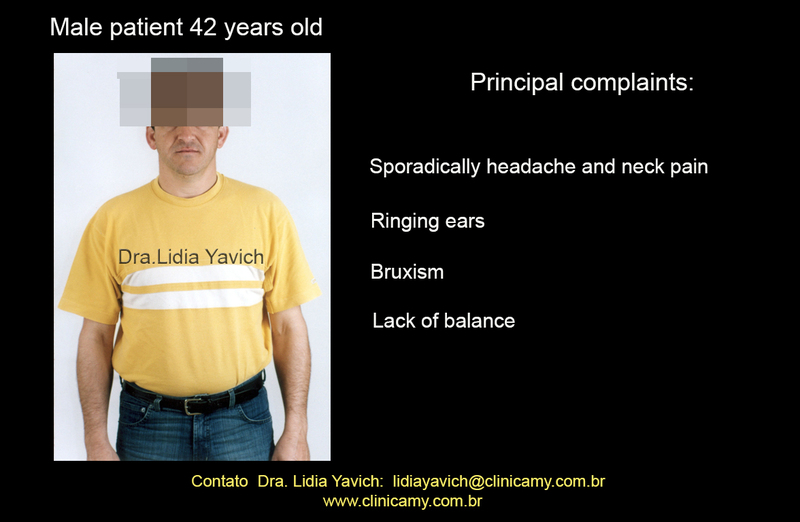 Male patient 42 years old arrived to the clinic referring a strong complaint because of the wear in his upper and lower arch teeth, frequent breakage of teeth, intense bruxism, shoulder pain and pain in the cervical spine. The patient reports an aesthetic problem in his appearance in relation to his frontal and profile semblance, and emphasizes that his teeth “are almost over.” In the image of the patient’s habitual occlusion we can observe the intense wear of the upper and lower teeth, especially the anterior sector. The patient had consulted a colleague to replace an adhesive fixed prosthesis. This colleague, Dr. Joao Souza was then attending the TMJ Pathologies Megarresidency program in our clinic in Porto Alegre. 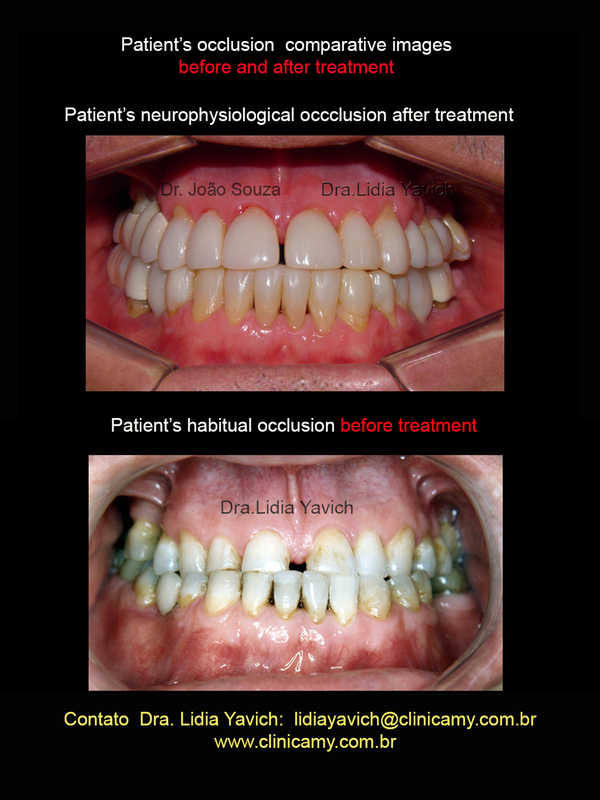 Dr. Joao Souza while looking at the profile, occlusion and wear condition of the teeth, suggested a consultation in our clinic for an evaluation of both the TMJ and also the non-surgical possibilities within the neurophysiological philosophy. The patient had already a scheduled orthognathic surgery, but still considered interesting to make another assessment of his clinic case. Analizing the occlusal view we can better see the high degree of wear and tear of the anterior upper and lower teeth. 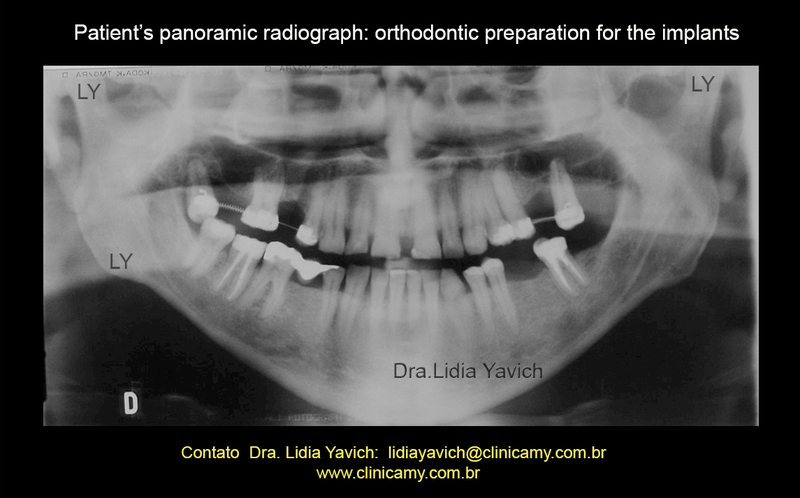 We can observe in the panoramic radiograph the absence of the dental elements 17, 15, 26, 28, 37, 36 and 45. The elements 38 and 47 are endodontically treated. 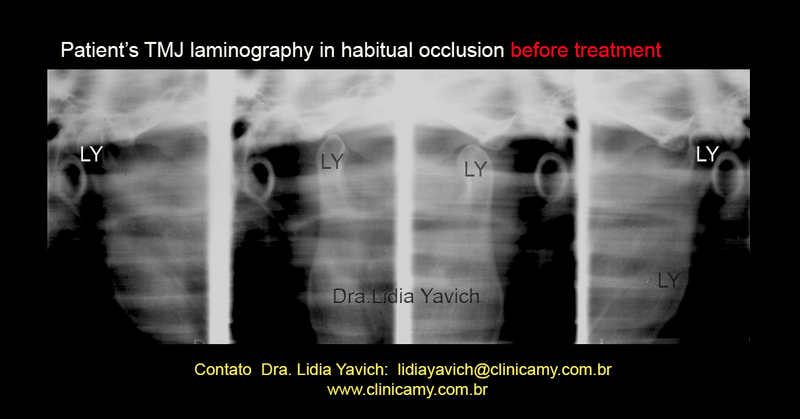 Patient’s TMJ laminography in habitual occlusion: we can observe the inferior and posterior positioning of the articular process on the left side, in the articular fossa, when the jaw is in maximal intercuspal position. In the maximum opening position we can observe the flattening of the anterior surface of the right articular process. We can also observe the anterior angulation of the articular process, on the left side, with the flattening of its posterior and upper anterior surface. 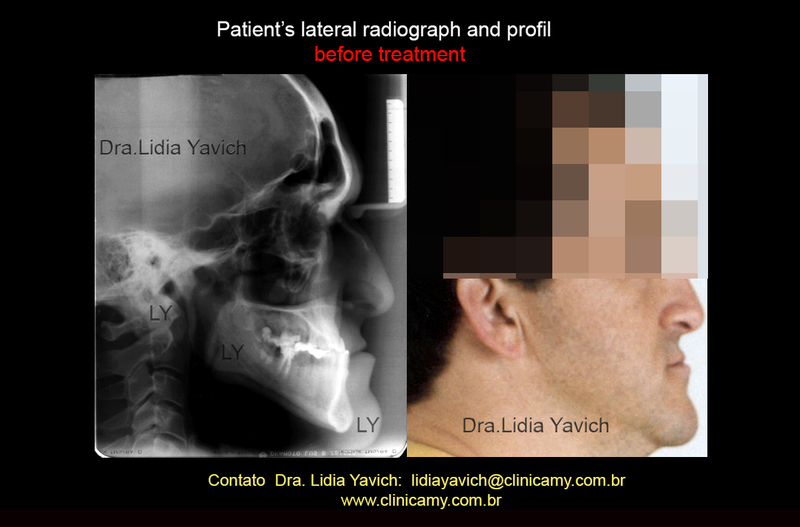 Lateral radiograph in conjunction with the profile image of the patient before the treatment. This images highlight the aesthetic problem that afflicts the patient. 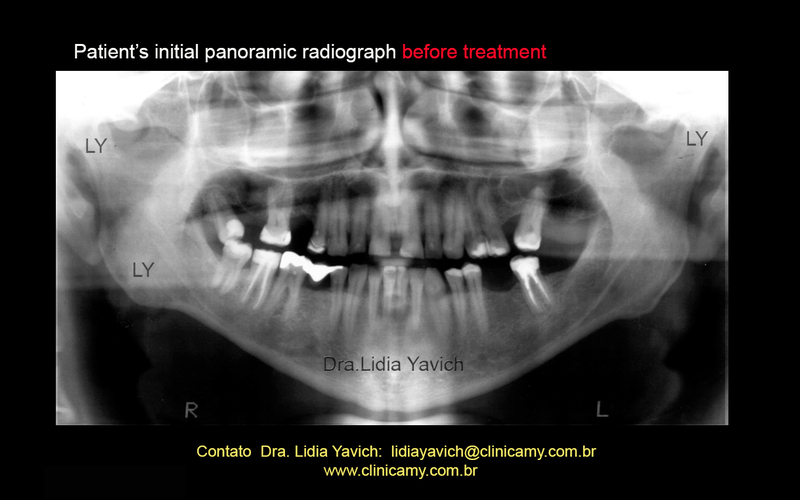 Patient’s frontal radiograph before treatment. 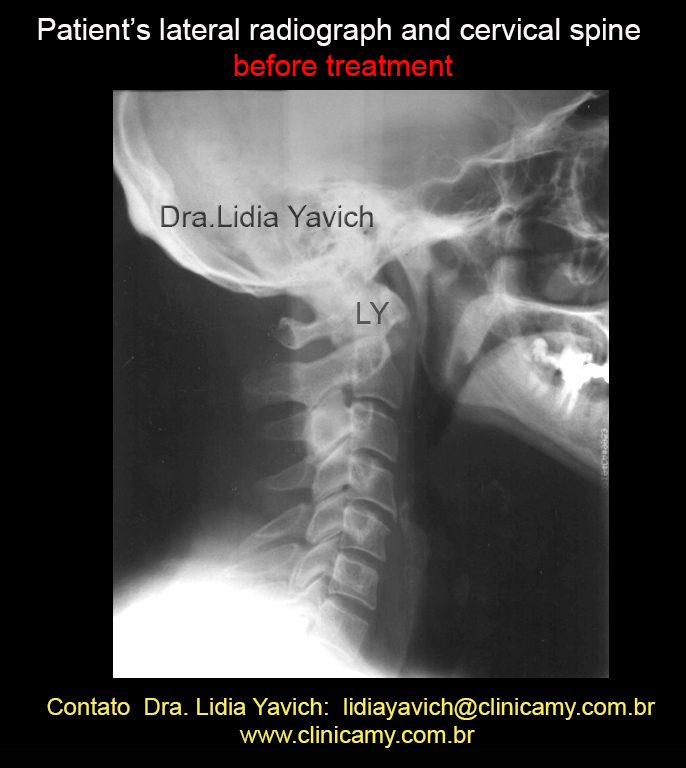 Patient’s lateral radiograph and cervical spine before treatment. 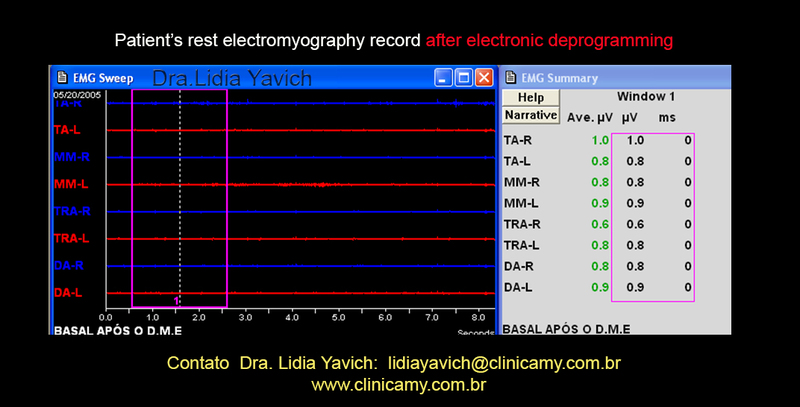 Electromyographic record before electronic deprogramming in the first consultation: slightly elevated activity of the left masseter muscle and both digastrics muscles at rest. All these masticatory muscles lowered their values after the electronic deprogramming. In this record we can see a decrease in the activity of masticatory muscles at rest after the electronic deprogramming. 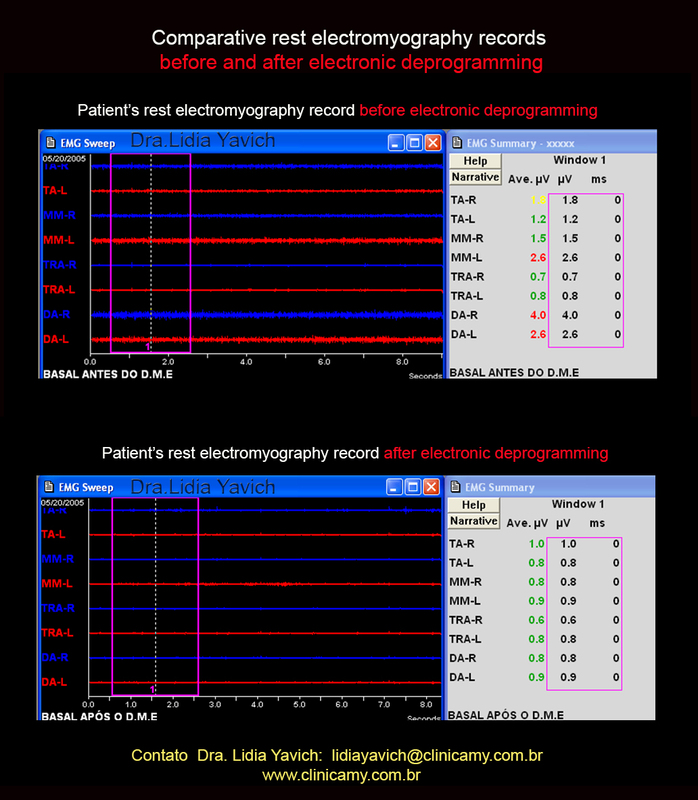 Comparative electromyographic records before and after electronic deprogramming of the patient first consultation. After the mandibular electronic deprogramming, it was verified the pathological increase of the interocclusal free space. This information, along all the auxiliary diagnostic tests, allowed us to propose a non-surgical neurophysiological treatment for the patient. 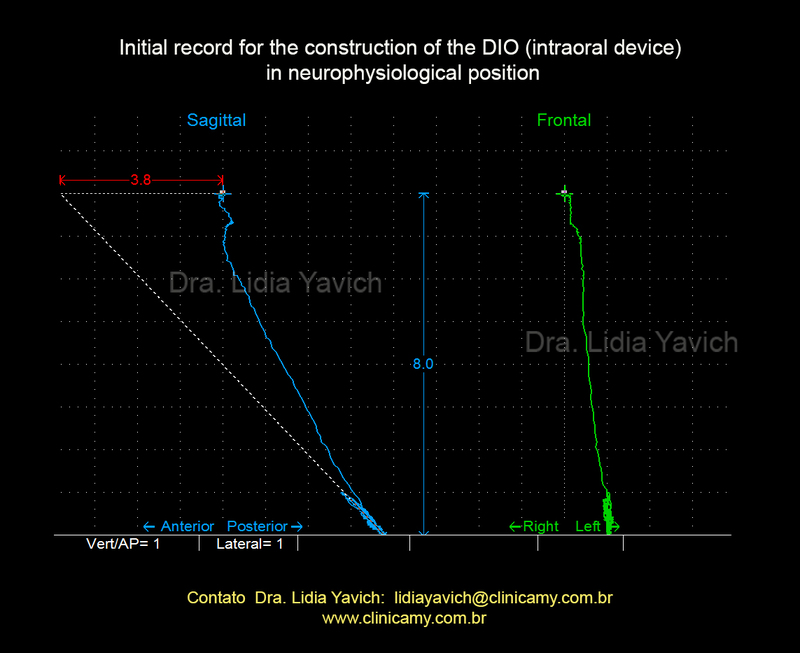 First we needed to locate the jaw in balance with the muscles with a DIO (intraoral device) built in neurophysiological position. Subsequently we needed to perform a three-dimensional orthodontics to maintain the neurophysiological position in conjunction with a neurophysiological rehabilitation while maintaining the muscle equilibrium initially obtained. For this it is essential to measure and control the patient in each and all of these phases. 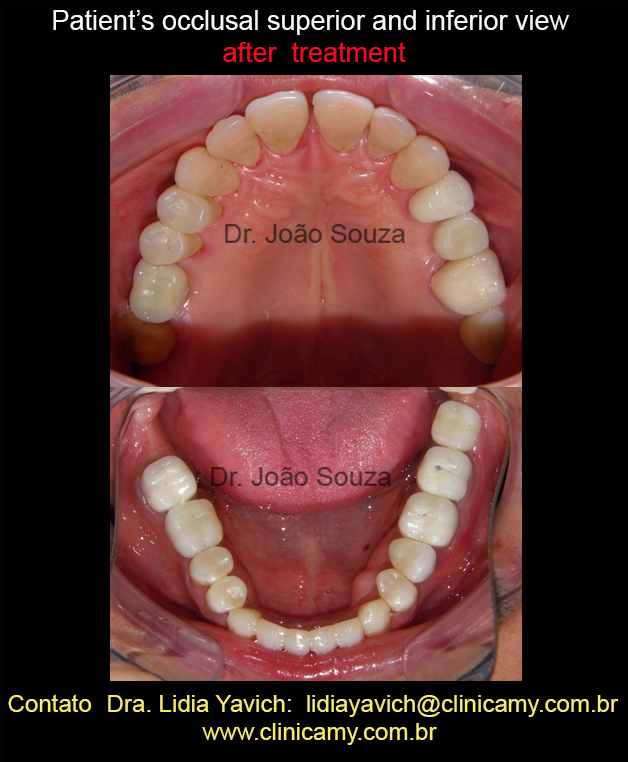 In this patient specific clinic case the recovery of the free interocclusal space would provide very good aesthetic and functional result! 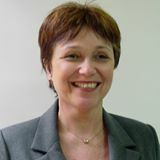 IT IS NOT IN ALL CASES that surgery can be avoided (EACH CASE IS A CASE) and even similar cases require a personalized assessment and a unique study. The patient was informed of all treatment stages and analyzing all the alternatives the patient accepted our clinical proposal. An MRI, (Magnetic Resonance Imaging) to analyze the disk and ligaments condition of the TMJ, (temporomandibular joint) was requested. The MRI revealed that the discs and ligaments were in good health. It was used neural transcutaneous electrical stimulation (TENS) in the mandibular division of the trigeminal nerve (V) to relax the masticatory muscles and record the rest position of the jaw. The patient had a pathological free space of 8 mm and a retrusion of 3.8 mm. This three-dimensional mandibular rest position had been recorded in the form of an occlusal bite registration, which was later used to construct a DIO (intraoral device). 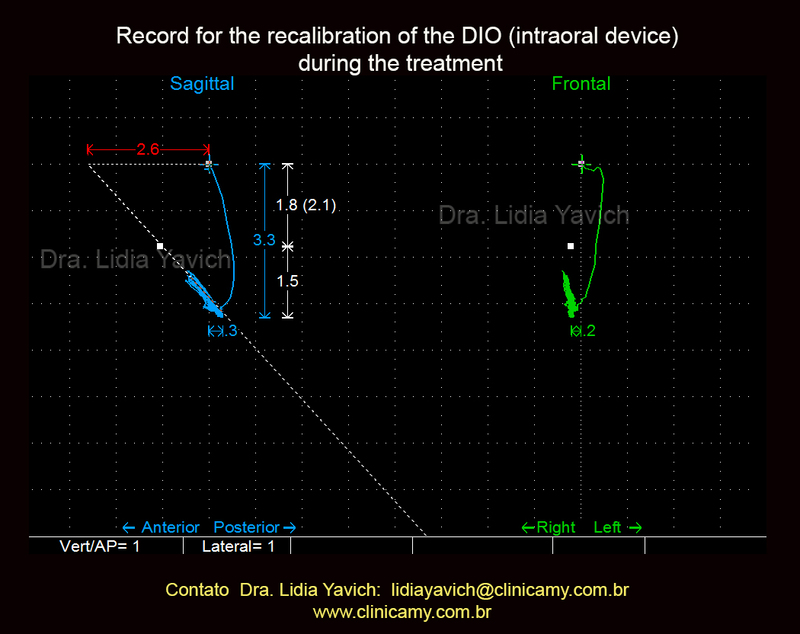 Registration for the recalibration of the DIO (intraoral device) during the first phase of the neurophysiological treatment. The DIO (intraoral device) is a removable mandibular device which in this case must be used during the day and night by the patient, including in the meals. This oral appliance is tested electromyographically and magnetographically to support this neurophysiological position. 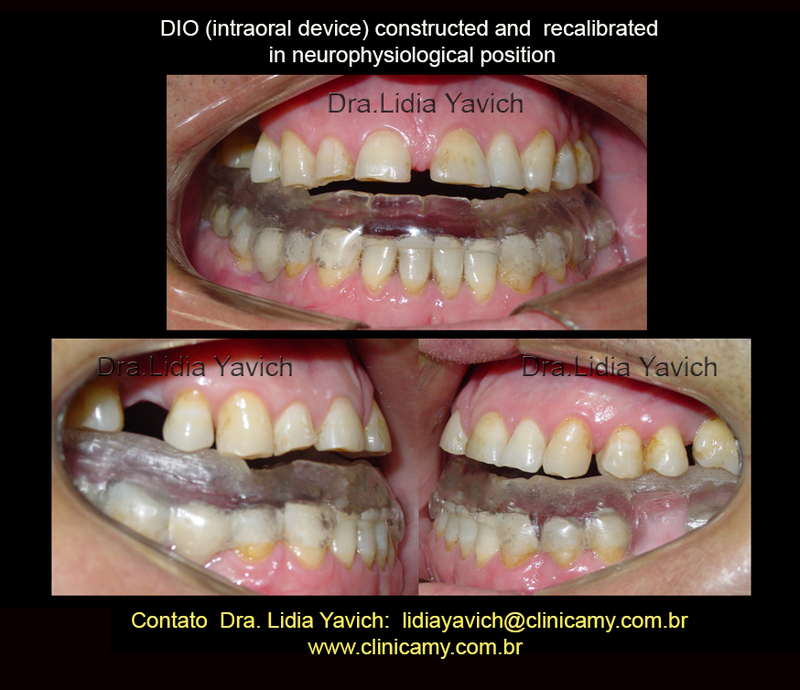 Patient profile images in habitual occlusion and in neurophysiological occlusion with the DIO (intraoral device) in mouth. 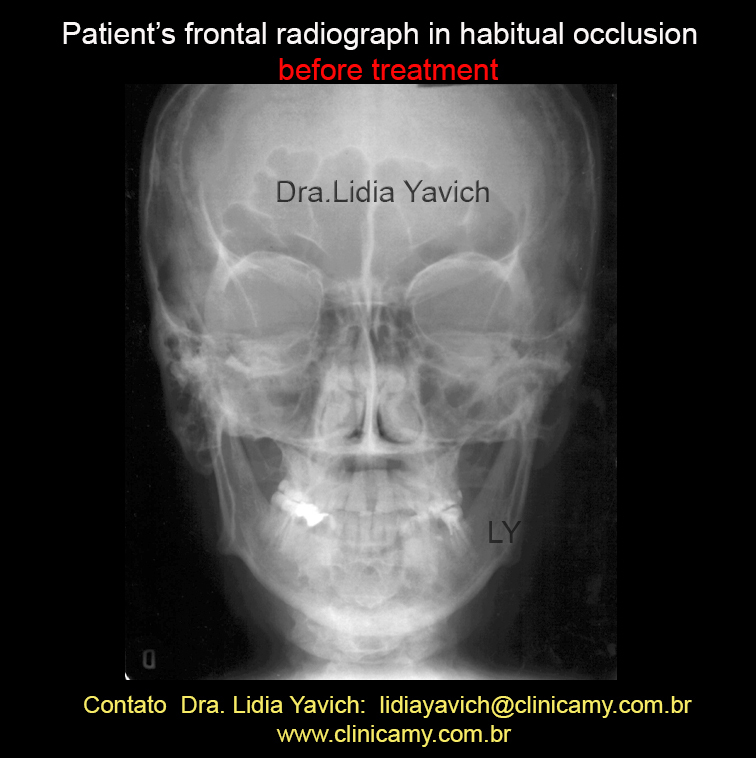 Patient frontal images in habitual occlusion and in neurophysiological occlusion with the DIO (intraoral device) in mouth. 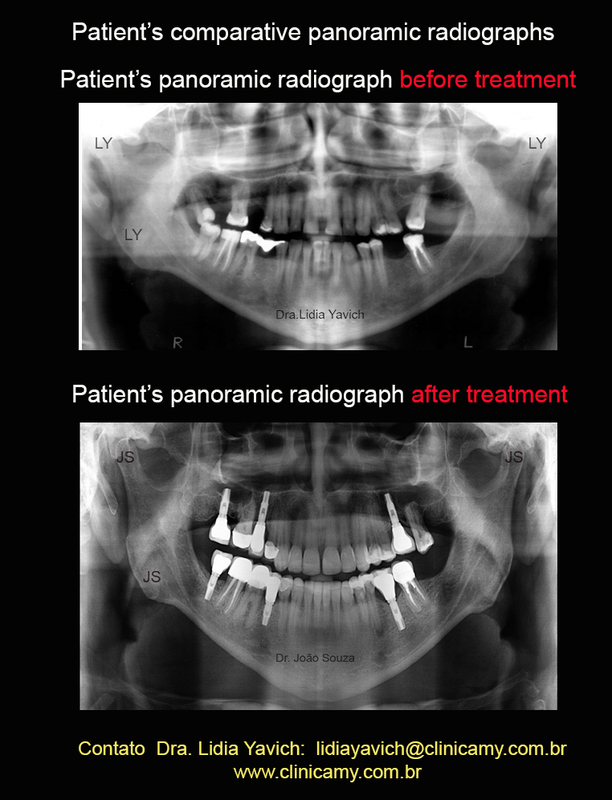 Patient’s panoramic radiograph shows the orthodontic preparation for the installation of dental implants. 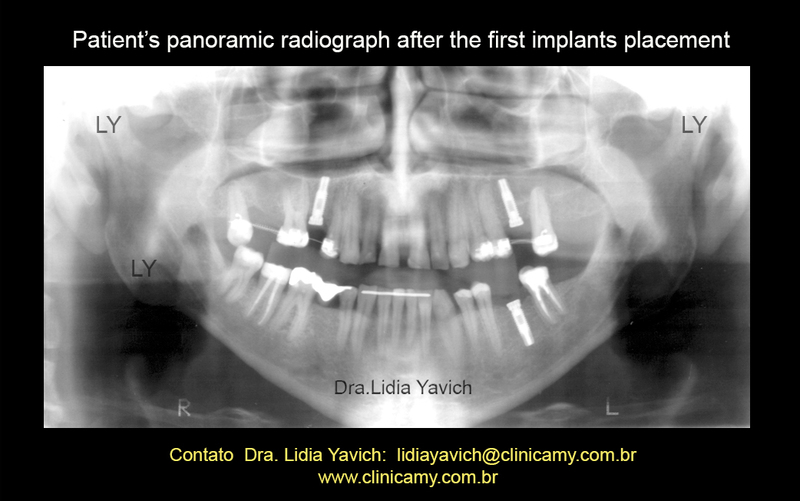 Patient’s panoramic radiograph after the placement of first dental implants. After the placement of the dental implants I began the orthodontic movement for reconstruction of the anterior teeth with composite resin. 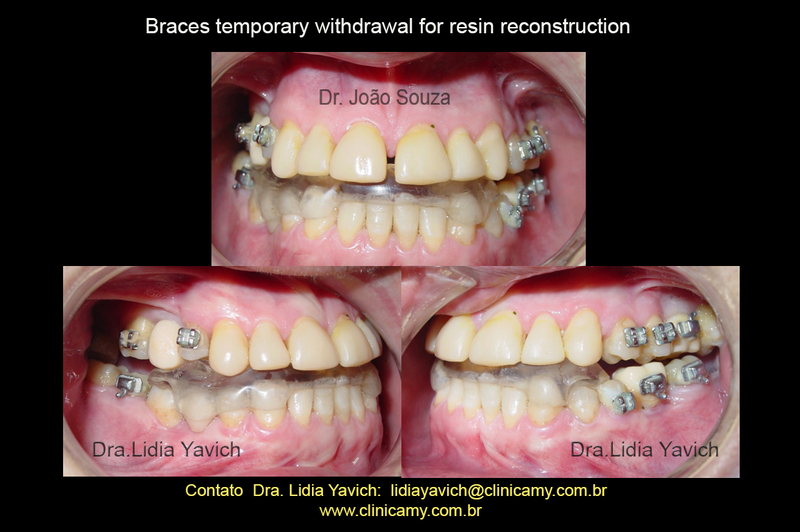 After the anterior movement of the anterior teeth the braces were temporarily removed to allow the reconstruction of the teeth with composite resin. 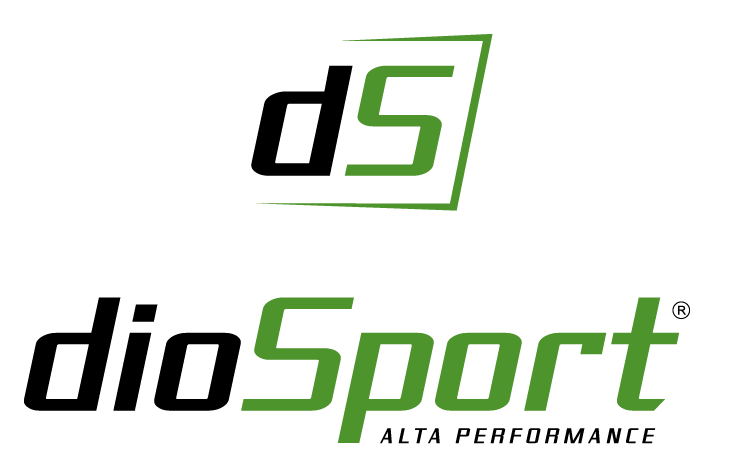 This rehabilitation was performed by Dr. Joao Souza following all the neurophysiological protocols. 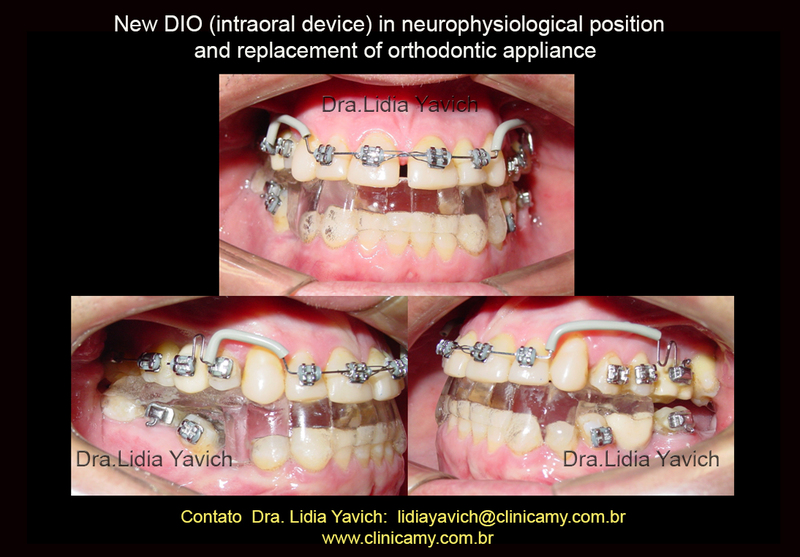 After the reconstruction with composite resin of the anterior sector, the orthodontic appliance was reinstalled and a new DIO (intraoral device) was constructed in neurophysiological position. The adhesive prosthesis of the lower right sector was removed and an implant was installed. 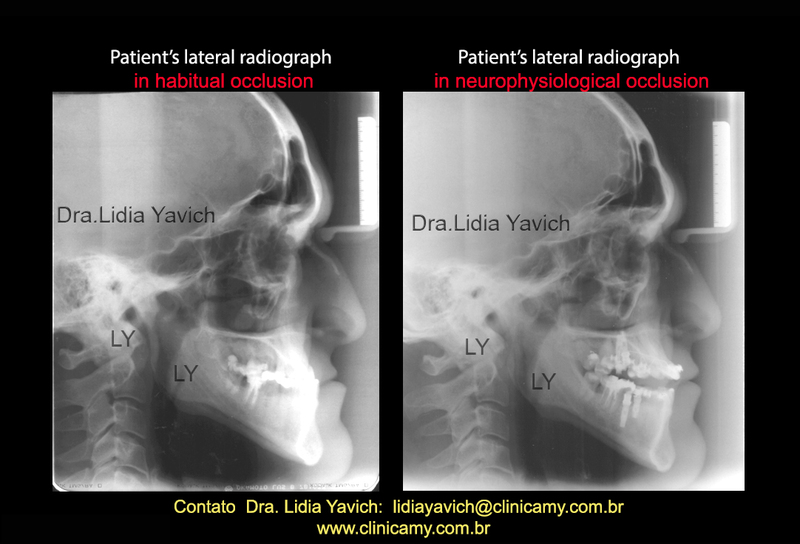 Patient’s comparative lateral radiographs in habitual occlusion before treatment and in neurophysiological occlusion during treatment. 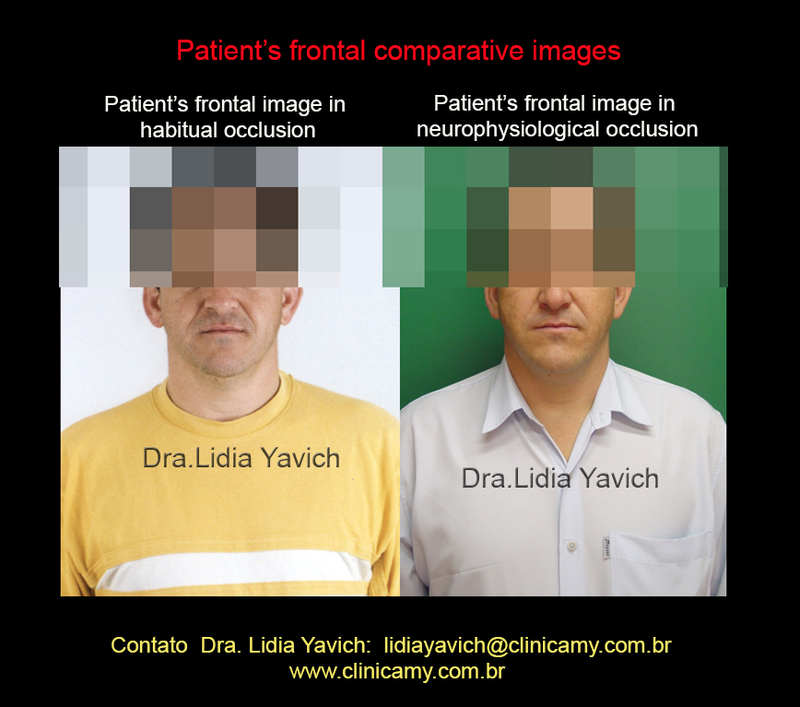 Patient’s comparative frontal radiographs in habitual occlusion before treatment and in neurophysiological occlusion during treatment. The TMJ laminography in neurophysiological occlusion shows the inferior and anterior positioning of the articular processes in the articular fossa when the jaw is in maximal intercuspal position. 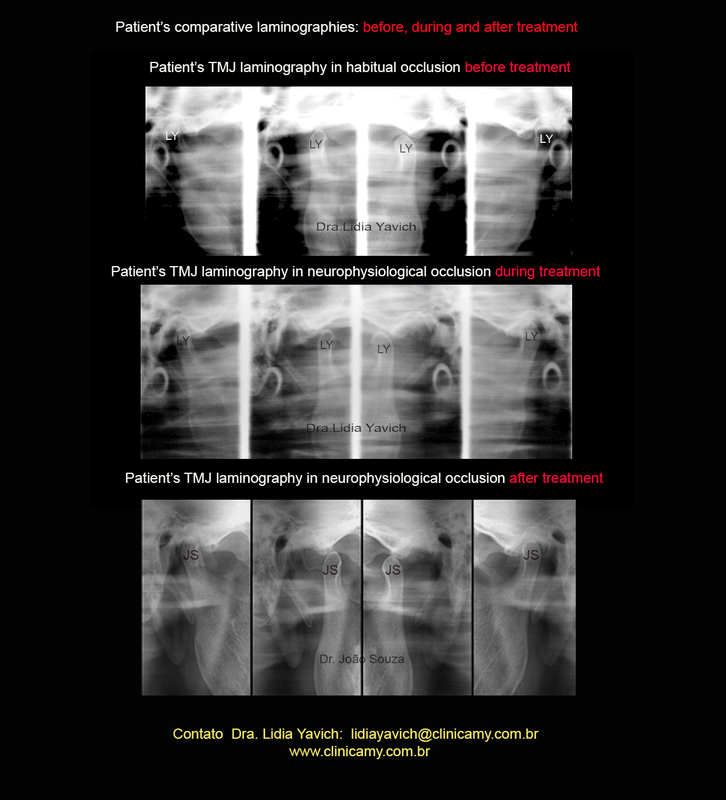 TMJ comparative laminographies: before and during neurophysiological treatment. 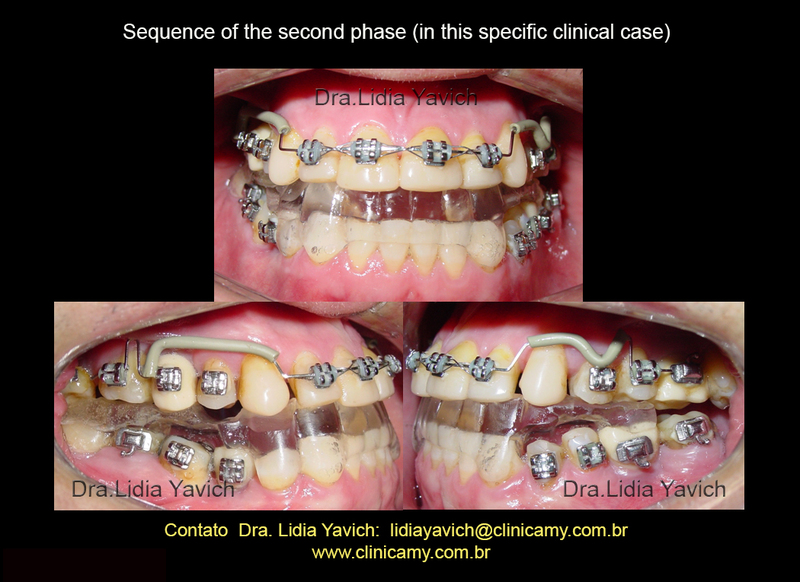 Sequence of the orthodontic treatment: preparation for the installation of the lower prosthetic implant. 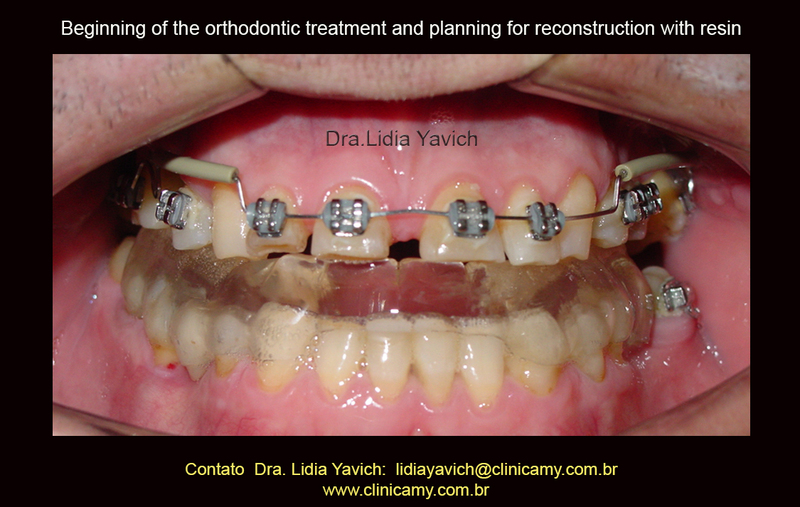 Installation of the provisional element in the lower implant and the brace placement on the same element. 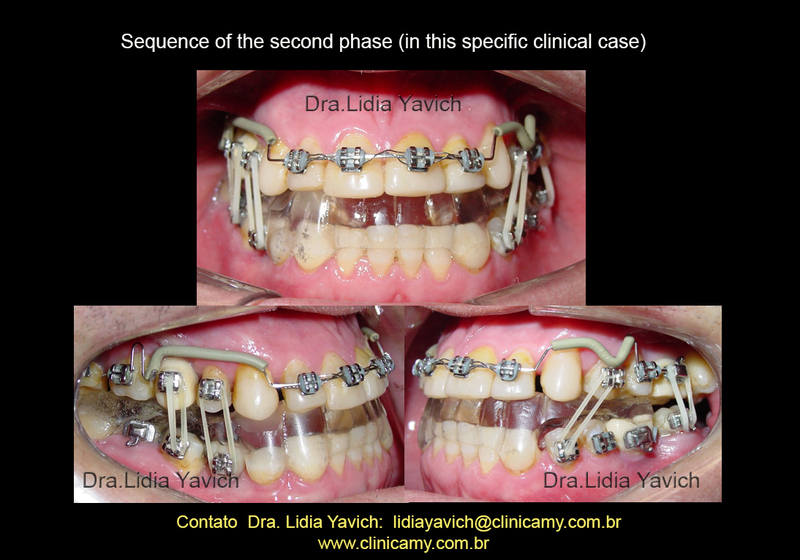 Sequence of orthodontic treatment for the active eruption of the posterior sectors. 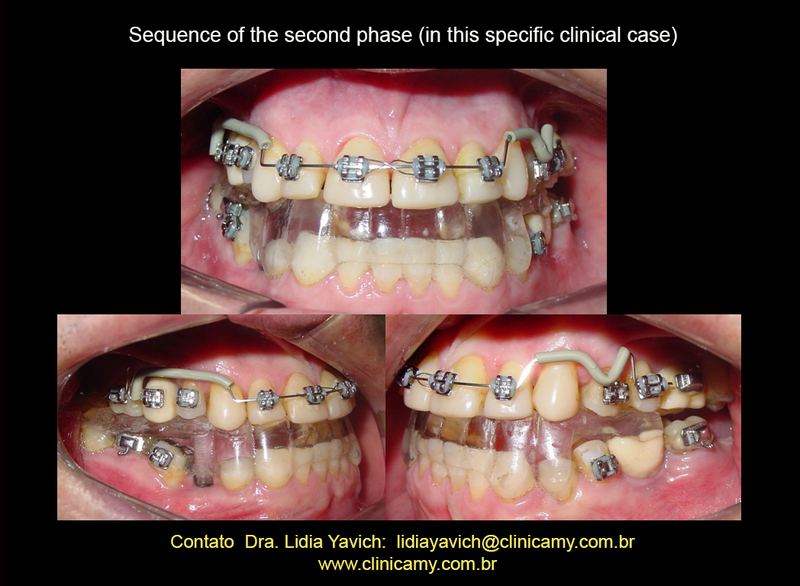 Sequence of the orthodontic treatment for alignment and leveling of the lower anterior teeth for reconstruction with composite resin. 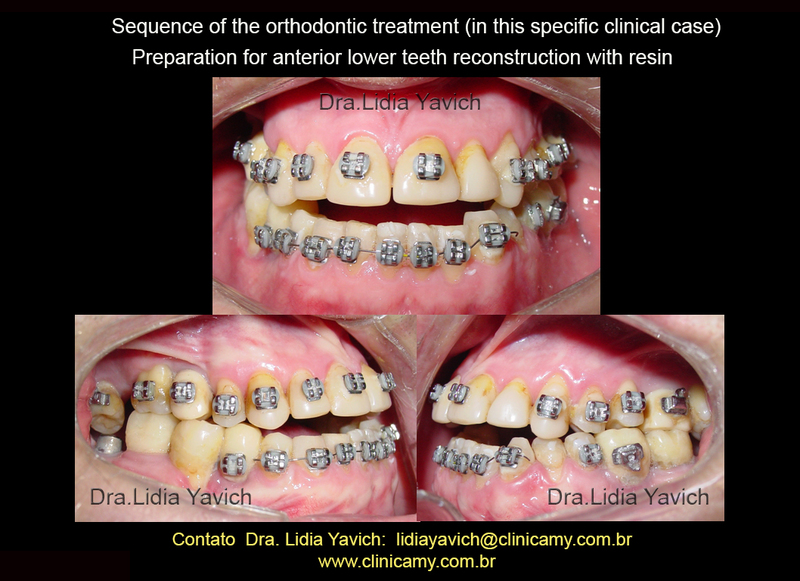 Sequence of the orthodontic treatment for alignment and leveling of the lower anterior teeth for reconstruction with composite resin. Finalization of all the phases of the neurophysiological treatment. 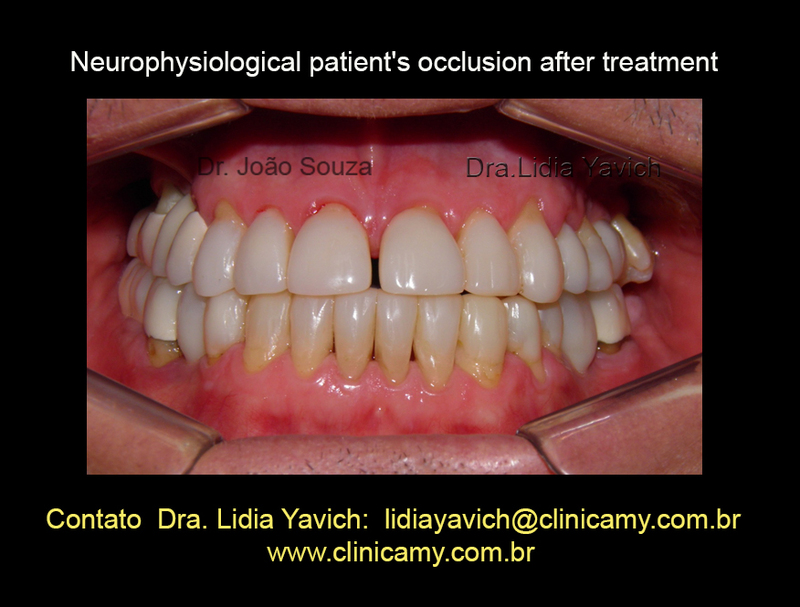 Upper and lower occlusal view in the finalization of the neurophysiological treatment. 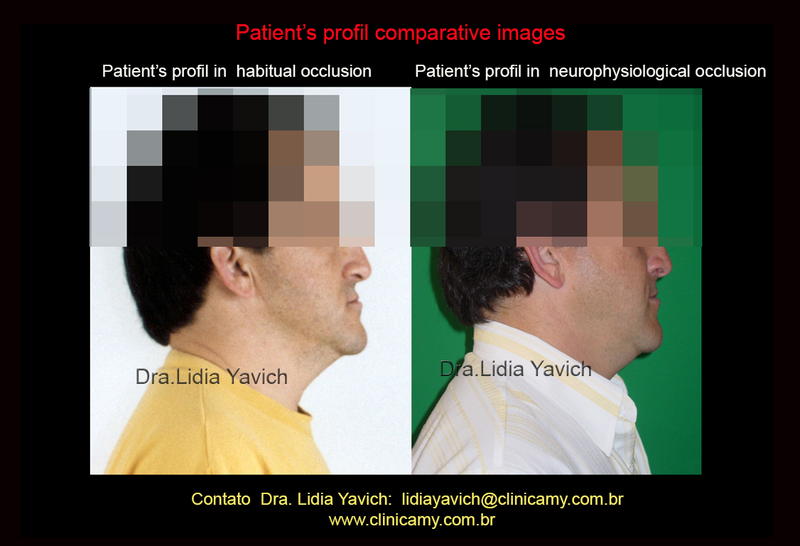 Comparative images of the patient’s occlusion before and after the neurophysiological treatment. 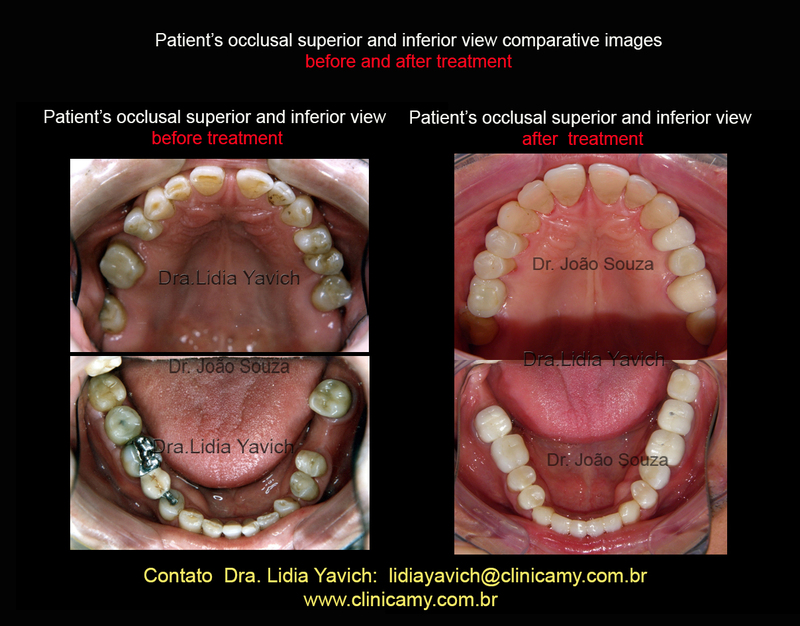 Comparative images of the patient’s upper and lower occlusal views before and after the neurophysiological treatment. 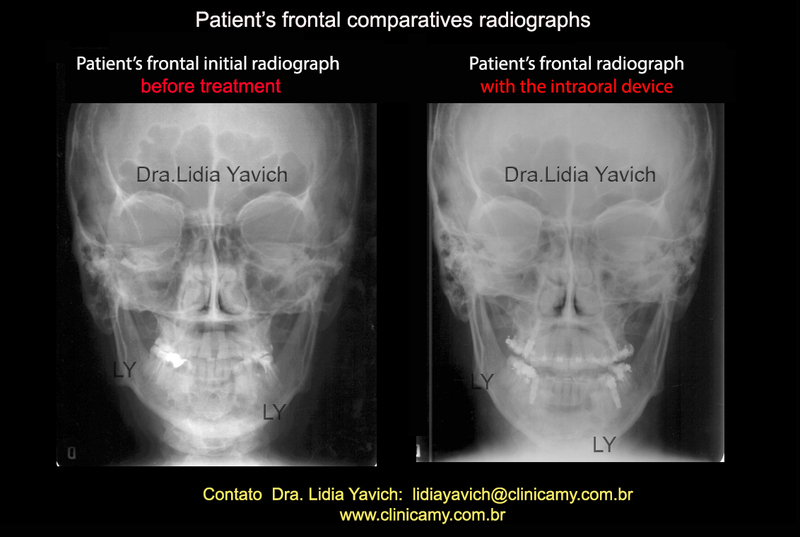 Comparative panoramic radiographs: before treatment and after the neurophysiological treatment, that included the first phase, the three-dimensional orthodontics and the neurophysiological rehabilitation. In the course of the treatment it was decided to install two posterior implants The lower due to an infectious process in the third molar, on the right, and the other implant, superior, on the same side, to better support the joint. 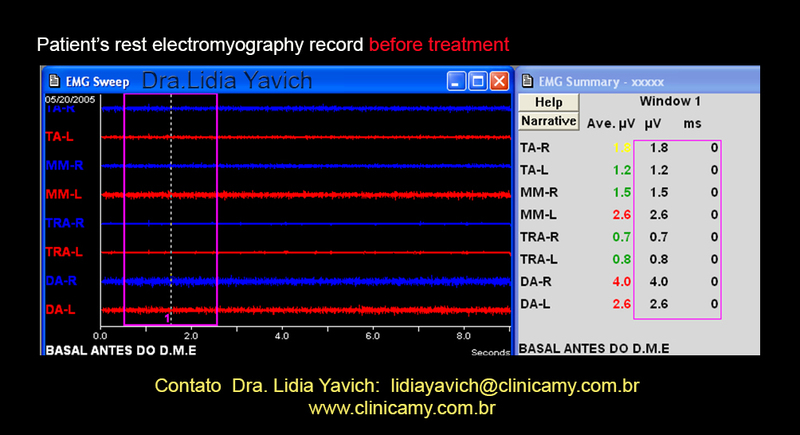 Patient’s TMJ comparative laminographies: before, during and after neurophysiological treatment. 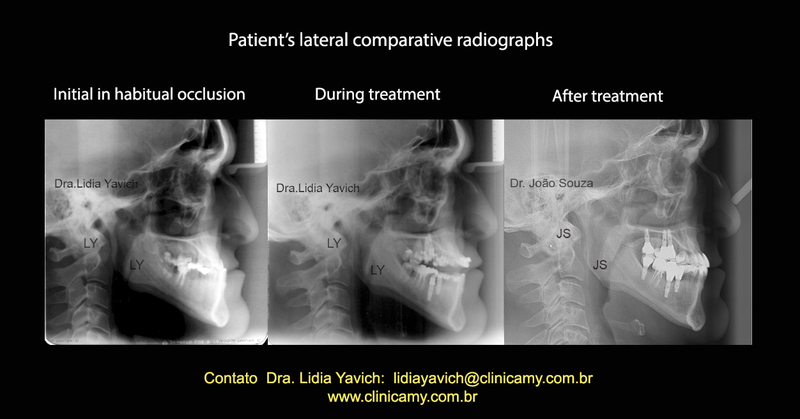 Patient’s lateral comparative radiographs: before, during and after neurophysiological treatment. 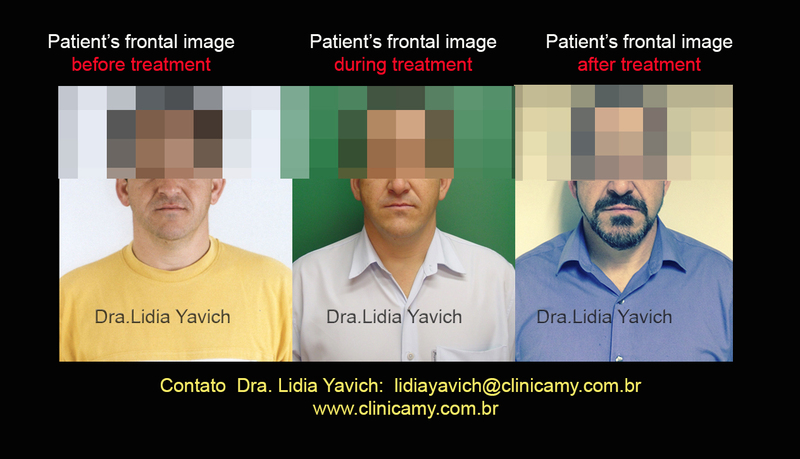 Patient’s frontal comparative images: before, during and after neurophysiological treatment. 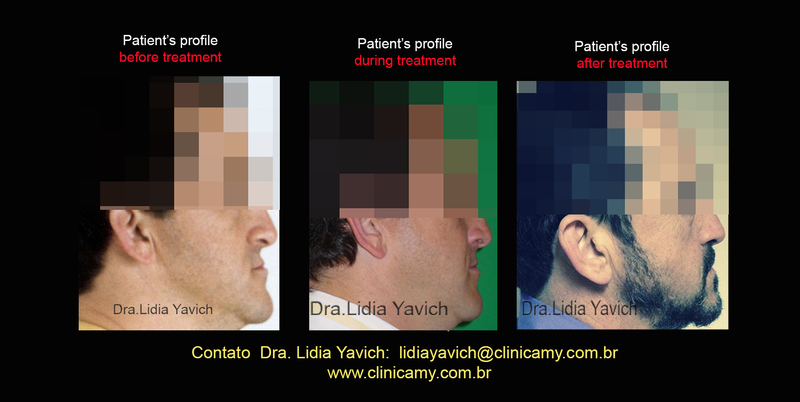 Patient’s profile comparative images: before, during and after neurophysiological treatment. The importance of Mandibular Rest Position by Electronic Deprogramming in the Treatment of Temporomandibular Joint Pathologies, Orthodontic Diagnosis and Oral Rehabilitation. Case report. I had already decided to have surgery for facial correction due to various problems such as wear of the teeth, bruxism, tingling, physical imbalance, pain and bad appearance. 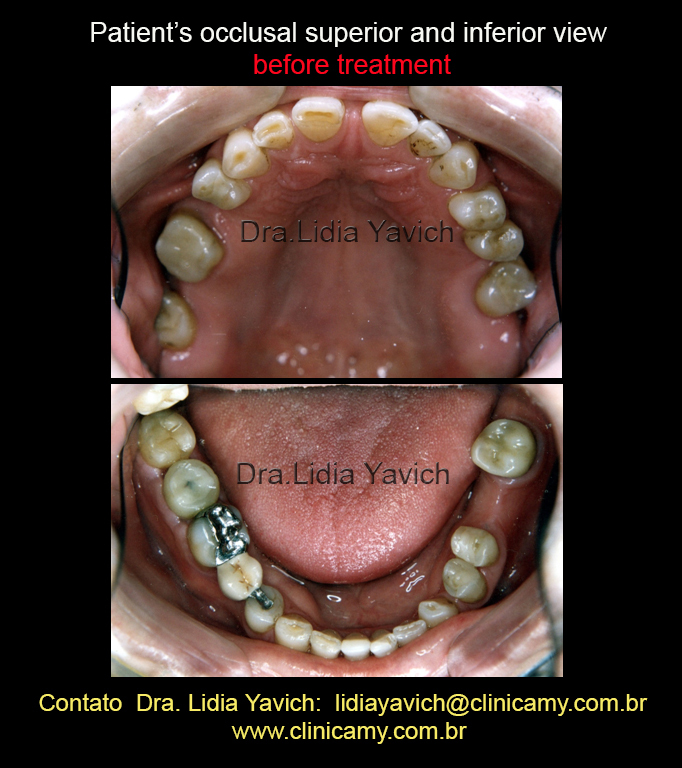 In a consultation for a small dental procedure with Dr. Joao Souza, I was advised by him to get in contact with Dr. Lidia Yavich for a consultation in order to see if there was any chance, in my case, to avoid surgery and solve the problems I was having. 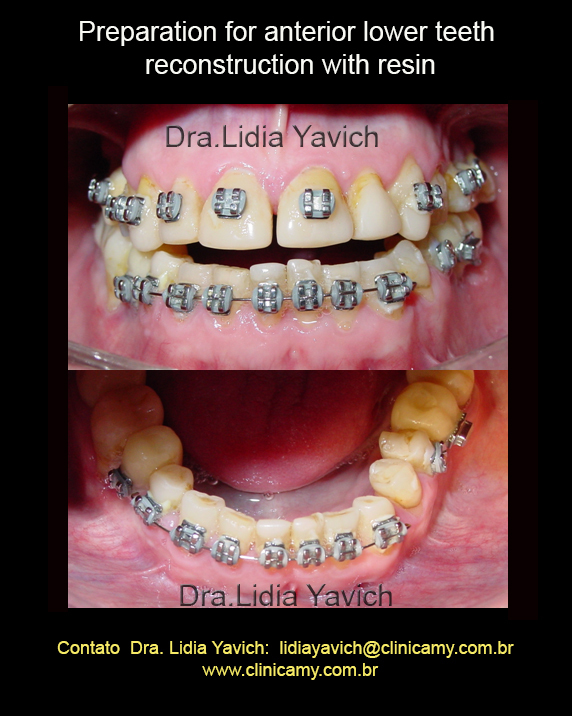 In the first consultation that I had with Dr. Lidia Yavich I was introduced to a facial and dental correction technique that gave me more security than surgery. Dr. Lidia stated that THERE WERE CASES WHERE SURGERY WAS ABSOLUTELY NECESSARY, but that in my case there could be another alternative. So, I started the treatment, and THAT really changed my daily life completely. Today I am very happy with the result achieved and the quality of life provided due to the disappearance of the above-reported symptoms. 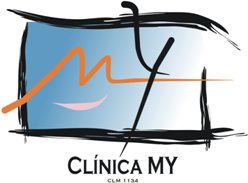 I would like to place on record that in addition to the professionalism of the entire team of Clinica MY, especially Dr. Lidia, I had the privilege to make great friendships with special people, that will always be a part of my life. I also want to leave a special thanks to Dr. Joao Souza, that with his recommendation made all this possible because he always strives for quality and the well-being of his patients.